Security is a vastly important facet of our day to day lives. It is so ubiquitous, few people recognize that they use it every day. However, if you ever visit a webpage that has “https” in the URL, you are using secure technology. Most of the early security protocols require that two parties have a secret exchanged between them. Unfortunately, if someone is listening to the key exchange, they can easily decrypt all of the messages sent between the two parties. You may find yourself asking, “But isn’t there some better way to exchange secrets?” You’d be right! The method is called Diffie-Hellman key exchange, and it relies heavily on modular arithmetic. The amazing thing about this protocol is that the two parties, Alice and Bob (in keeping with the cryptographic tradition of keeping names simple) can even publish their communications in the newspaper. Anyone can be listening to these two exchange their keys. 1,2,3,4 are relatively prime to 5. As you can see, each number that is relatively prime to 5 is represented by some power of 3. Therefore, 3 is a suitable primitive root mod 5. Next, Alice determines ga mod p, and Bob determines gb mod p. We’ll call these c and d, respectively. Now, Alice and Bob will exchange their values. Again, this can take place in the open. Now, Alice has d, and Bob has c. Next, Alice performs da mod p, and Bob performs ca mod p. This has the net effect of giving both Alice and Bob the same number. They are now both in possession of gab mod p. What’s more, any attacker could have watched the entire exchange, and wouldn’t have gotten anything out of it. Secrecy in Plain Sight. Image: A.J. van Hinck, via Wikimedia Commons. Alice chooses 3 as her secret number. Bob chooses 5 as his. 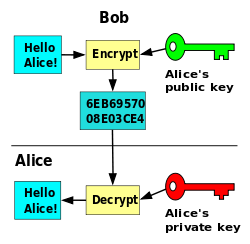 Alice and Bob now have the same number, which they can use for regular cryptography. Obviously, in a real situation, Alice and Bob would have chosen much larger numbers, but this suffices for an example. You may wonder, “I really want to steal nuclear secrets! Is there some way that I can still eavesdrop on people using Diffie-Hellman?” You’d be right! Diffie-Hellman is vulnerable to what is known as a “man-in-the-middle” attack. This is difficult, as it requires being present at the time the keys are exchanged. However, the attack is simple. All that needs to be done is that some attacker Eve (short for eavesdropper) intercepts Alice and Bob’s messages. When Alice sends Bob her key, Eve steals it, and substitutes her own key. Bob then responds, and Eve steals his response. She then gives her own key to Alice. Now, there are two unbreakable passwords, and Eve has both of them. However, there is a limitation: Eve needs to be present for the entire conversation, or Alice and Bob will immediately know something is wrong. This is because the key that Alice has is not compatible with the key Bob has. Suddenly, all of their communication will be reduced to gibberish, and they will know that they are compromised. However, it is possible for Eve to hijack their conversation, leaving none the wiser. We may ask, why not use RSA? Well, we do! If we combine RSA with Diffie-Hellman, we gain protection against eavesdroppers and hijackers. Diffie-Hellman is faster than RSA and can encode larger messages than RSA. (The messages sent by RSA are limited in size, lest it become easy to crack.) In addition, using these two approaches combined gives us the ultimate goal of cryptography: Perfect Forward Secrecy! If the secret numbers used by Alice and Bob are discarded, nobody can read the messages exchanged between the two, ever. That’s right, 30 years down the line, when someone digs up Alice’s old machine out of some attic in Nebraska, they won’t be able to read the messages she shared with Bob. This is the real advantage of Diffie-Hellman, and the reason that it will likely remain in use for a very long time. This entry was posted in Big Problems and tagged cryptography, cryptology, encryption, online security, RSA on April 23, 2015 by maddonnelaith. If you’re anything like me, you need to send TOP SECRET messages all the time. Just the other day, I was working on a really hard problem set for my History of Math class, so I decided to ask my good friend Maryam Mirzakhani to do it for me. This, of course, went against my University’s cheating policy, so I needed to be sure that my message was encrypted securely enough that my resourceful and mathematically gifted professor Evelyn Lamb couldn’t read my message and fail me for cheating. Luckily, by the grace of modular arithmetic, I was able to have a quick exchange with Maryam just in time to hand in my assignment undetected. Below I’ll discuss the rad encryption algorithm Maryam and I used to exchange messages, and the clever but unfortunately unsuccessful algorithms my suspicious professor tried to discover our ploy. We decided to encrypt with RSA and pay homage to the best public-key cryptosystem around. RSA is an asymmetric algorithm, which means that the keys of the sender and the receiver are completely independent. Maryam and I needed to independently complete the steps below to exchange encrypted messages. 1) I chose 2 extremely large prime numbers p and q.
I went with my favorite primes, 61 and 11. So for me, n = 11*61 = 671, and ϕ(n) = 10*60 = 160. The number e just needs to be coprime with ϕ(n), a common choice is 216 + 1 = 65,537 but 3 is sometimes just as good a choice. I chose e = 7, just because I happen to like 7. 4) Found my private key exponent, “d” as the multiplicative inverse of e mod ϕ(n). That is, find d such that d*e = 1 (mod ϕ(n)). Normally, you can do this using the extended Euclidean Algorithm. But I instead used the coveted Wolfram-Alpha algorithm, and found that d = 23. After these steps Maryam and I each had a public and private key- you can think of these as keys that interchangeably lock and unlock the message. Anyone listening in (like Professor Lamb) can see each of our public keys- this is what allows strangers on the internet to securely exchange messages. The public key consists of n and e, and the private key is d. My public key was (n = 187, e = 7) and my private key was d = 23 (but don’t tell Professor Lamb!) Maryam broadcast her public key, which was (n = 779167, e = 17). c2 = 1017 (mod 779167) and so on. This is because I encoded the cypher-text as c = me (mod n), so when Maryam computed cd, she had actually computed (me)d (mod n) = med (mod n). Recall that Maryam very carefully chose e and d so that e*d = 1 (mod ϕ(n)). This means, thanks to Fermat’s Little Theorem, that med (mod n) is the same as m1 (mod n). Excellent news, this is just my original message! Thanks, modular arithmetic! We could now securely exchange messages, and for even more security I even left a signature in my message so that Maryam could be sure the message actually came from me. But not so fast! Professor Lamb noticed that Maryam and I were exchanging mysterious messages, so she took a stab at decoding them. RSA is a secure algorithm because it is very difficult to factor large numbers. This means that for Professor Lamb to decode the message that I sent to Maryam, she needed to find d. To find d, she needed to know what ϕ(n) = (p-1)*(q-1) was, because you need to know the modulus before you can find the inverse of an element, and to find ϕ(n) she needed to figure out p and q. Therefore, the only thing standing between me and expulsion for cheating is the fact that it’s very hard to factor very large numbers. Notice, however, that all the other information is publicly available- c, e and n can be viewed by everyone. 1. She chose a positive number B. Professor Lamb liked the number 5, so she set B = 5. 2. Computed m as the least-common multiple of the positive integers less than B. 3. Set a = 2. 5. If g isn’t equal to 1 or N, then you’re done! Professor Lamb found that 61 was a prime factor of 5917! Slick! 6. Otherwise, add 1 to a and try again. If you’ve already tried 10 times, just give up. Luckily she didn’t need to use this step, but for a lot of different n’s she probably would have. Luckily for me, Maryam and I chose a secure encryption algorithm. RSA is set up so that to decode the message, you need to know the prime factors p and q of the modulus n. You need p and q so that you can find the inverse of the public key mod (p-1)(q-1), and these public and private key exponents work to encode and decode the message because of Fermat’s Little Theorem. Professor Lamb tried to decode our secret messages by factoring Maryam’s public key modulus with Pollard’s p-1 algorithm, but unfortunately it did not yield a prime factor. Because finding large prime factors is such a difficult problem, Professor Lamb wasn’t able to read our secret messages, and I got an A on my homework. – I obviously didn’t ask Maryam Mirzakani to do my Math History homework. She’s an incredibly intelligent lady, working on much, much more difficult things, and apparently getting awesome results. – Even though I motivated the need for privacy in my silly article with my desire to keep my professor from finding out I was cheating, privacy is obviously very important for a wide range of reasons(possible hyperlink? ), and is equally important to protect people who don’t have anything to hide. 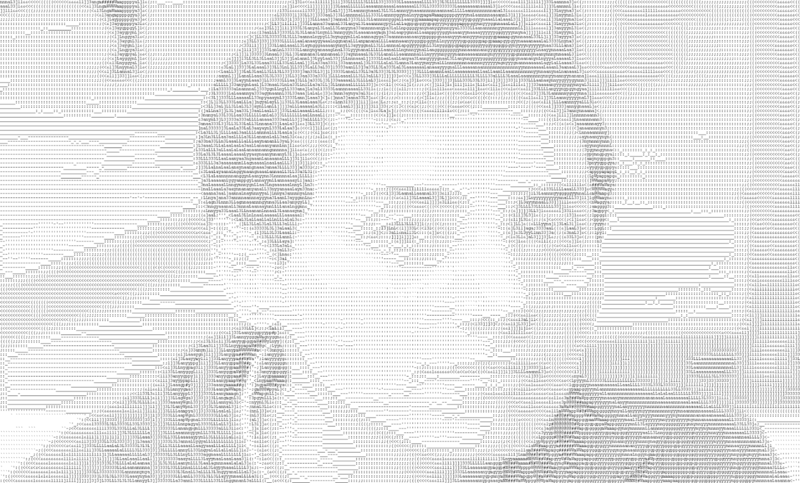 – The ascii art image of Maryam Mirzakani is obvious very cool! It was made by my very talented friend Tobin Yehle, who wrote a neat program to translate photos into ascii art. This entry was posted in Numbers and tagged cryptography, cryptology, RSA on March 25, 2015 by anniecherk. After reading several different sources of math history, I was attracted by Fermat’s history and his theorems about prime numbers. I realized that I am kind of interested in these numbers and anything related to these numbers after digging into the computer science major for few years. Why? I think the primary reason is because prime numbers are widely used in computer science for security. For example, the RSA algorithm, which is a public-key crypto system, uses prime numbers to generate public keys. If you are not familiar with the RSA algorithm, I will explain a little bit more here. Basically, the RSA algorithm generates a public key based on two large prime numbers. The prime numbers are secret. Anybody is able to use the public key to encrypt a message. When I first learned this RSA algorithm in my algorithm class, I felt like it was magic! After taking computer networking, the computer networking class, I realized that prime numbers were everywhere in my life. For example, you go to amazon.com to buy some stuff, you need to login to your account and pay the bill online. Behind the scenes, there are prime numbers securing your account and transactions. This interest brought a new question to me, which was how to generate a big prime number? Another way to think about this question is how to determine whether a number is a prime? FLT and modern computer science. Image by the author. Because of my curiosity about prime numbers, I enjoyed reading and thinking about FLT. In class, FLT means Fermat’s Last Theorem, but in this blog post, it means Fermat’s Little Theorem. Basically, FLT says if p is a prime number, then for any integer a, a^p – p is a multiple of p. If a is not divisible by p, then a^(p-1) – 1 is an integer which is multiple of p (Wikipedia). How can this math theorem help a computer science student? I solved some programming questions related to prime numbers. For example, generate all prime numbers less than n. If n is 10, my program should return 2, 3, 5, 7 as a result. The other programming question was to write a program that runs a primality test, which is used to see whether a number is prime. For example, if the input number is 10, my program should return true if 10 is a prime number and false if 10 is not a prime number. I was able to solve such questions by using an inefficient algorithm. If a number was very big, it took more than an hour to get the final result. Obviously, I did not expect such a slow algorithm. By combining FLT into programming, I can write an efficiency algorithm to solve those questions. Computer science majors might be wondering how a Fermat primality test works. First of all, we have an integer n and we need to choose some integers co-prime to n. Then we need to calculate a^(n-1) mod n. Let’s say the result is different from 1, then n is composite. If the result is 1, then we can say n may or may not be a prime number. For example, let’s use p = 341 and a = 2, then we have 2^340 = 1 (mod 341). Obviously, 341 is not a prime number because 341 = 11 * 31. So we call 341 a pseudoprime base 2. Such a pseudoprime number is also called a Carmichael number. This is a primary reason why we cannot directly use the FLT for a primality test: it will be fooled by some Carmichael numbers. That means we have to do something else to get it work on solving programming questions! There are only 21853 pseudoprimes base 2 for n from 1 to 25 * 10^9. How does this data help us? If 2^n – 1 mod n = 1, then n is a prime number, or n is one of those 21853 pseudoprimes. I think we can build a list of pseudoprimes before running our program for primality test. When we need to check if a number is a prime number, we can check if this number is a pseudoprimes in the list. If it is not one of the pseudoprimes, we can start running the program for primality test. The FLT was like the roots of a binary tree. People used this root to branch out its left children and right children. In our case, one of the children referred to is the Fermat primality test. At this moment, I cannot stop digging deeper in this tree. I want to traverse the whole tree just like running a breadth-first search in my brain. Number theory is a mystery! After reading the articles, I asked myself a question “How many unknown theorems still exist?” It might be like the universe – people have only explored a tiny part of it. It may hide more secrets behind the scenes – people need time to reveal those secrets. 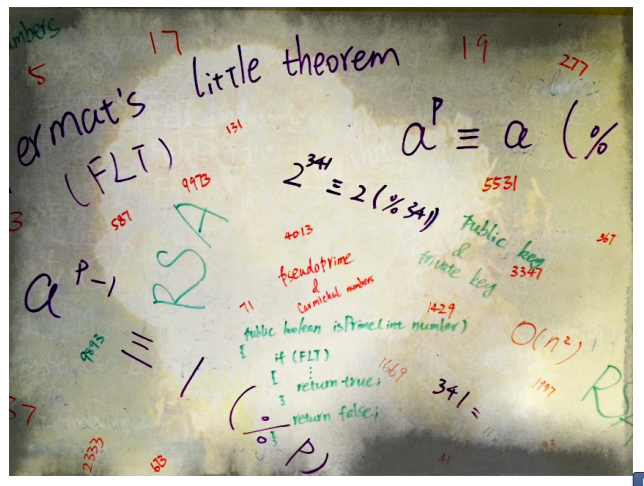 Probably after a few years, scientists will discover many more theorems, just like FLT. This entry was posted in Numbers and tagged Computer Science, Fermat, Fermat's little theorem, RSA on February 23, 2015 by kingsleyzheng. We live in an era where the internet is king. 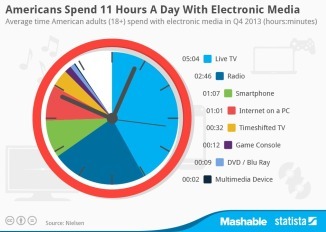 Between our cellphones, tablets, game consoles, laptops, and other devices, the average American adult (18+) spends 11 hours per day ingesting electronic media in some way, shape, or form. I’m sure we can all admit that on a weekly basis we access or create data that we don’t necessarily want the public to see. Whether it be our bank account or credit card information, our Facebook interactions, our emails, our tweets, our PayPal activity, or even our browsing history. That being said, I’m sure some of us take our internet privacy for granted; but how exactly does are internet privacy remain… private? The answer is simple: modular arithmetic. More specifically, cryptographic algorithms. Cryptography dates back to Egyptian scribes in 1900 B.C., and it was first used in their hieroglyphs. The Egyptians presumably wanted hide the content of their hieroglyphs from others, and they used very basic cryptography to do so. As you can imagine, this whole “keeping a message’s content safe” idea would become widely popular as mankind become more and more intelligent. The Romans, specifically Julius Caesar himself, created the first truly math-oriented cryptography. He used it primarily to protect messages of military significance. Caesar’s cryptographical ideas would later be used to build out modern day cryptography. There are two main types of cryptography widely used across the web today: symmetric-key encryption, and asymmetric-key encryption (we’ll go into details later, I promise!). Both of these types of encryption rely on modular arithmetic. We must give credit where credit is due. Friedrich Gauss (1777-1855), birthed modular arithmetic in 1801. Believe it or not, this famous mathematician made most of his breakthroughs in his twenties! For those that aren’t familiar with modular arithmetic, here’s a timeless example (pun intended, wait for it…). The length of a linear line can have a start and end point, or it can go on to infinity in either direction. In modular arithmetic, the length of a “circular” number line is called the modulus. To actually do the arithmetic, consider this example: Take a regular clock (see, here’s the pun! ), consisting of the numbers 1-12 . Clocks measure time on a 12 hour time table before starting back over at 1. The modulus for a 12-hour clock is 12 because it has 12 different numbers for the number of hours. To actually do the arithmetic, take this for example: It’s 8PM and we want to add 9 hours (8 + 9 mod 12). 8 +9 equals 17, however when using a modulus of 12, our number line wraps back around after counting to 12. For this we would count forward from 8 – ie. 8, 9 ,10, 11, 12, 1, 2, 3, 4, 5. So, (8 + 9 mod 12) = 5 AM in this case. A basic Caesar Cipher using a left shift of 3. Image: Matt_Crypto, via Wikimedia Commons. As I said above, the Caesar cipher has acted as a building block for some of our modern day cryptography. Caesar’s main encryption step is incorporated in some of the more complex schemes we still rely on today. However, the Caesar cipher can be easily broken, or decrypted (more on this soon!). This particular cipher is concerned with the alphabet. The theory behind it is replacing each letter in the alphabet with a different letter some fixed number of positions down the alphabet (this is reffered to as the shift). For instance, with a shift of 3, A would replace D, and B would replace E.
This cipher is extremely easy to break. There are only 26 possible shifts (26 different english letters). When taking a brute-force approach, it’s only a matter of varying through the different shifts until the message is decrypted. In fact, this process could be optimized by analyzing the encrypted string, finding frequently used letters and associating them with common vowels. That way, you could brute force using intelligent shifts. However, this approach would have to be modified when switching between languages. As promised, I will explain the two types of internet cryptography. First, we have symmetric-key cryptography. This is based on the concept that both communicating parties share the same key for encryption as well as decryption. This key is mathematically applied to a numerical equivalent of the data each party is encrypting/decrypting. It is imperative that this key is kept secret. If another party finds out what the key is, none of the encrypted data is safe anymore. Symmetric-key cryptography uses either stream ciphers (encrypt the numerical representation of the data one digit at a time. ), or block ciphers (taking blocks of digits, and encrypting them as a whole). Symmetric-key algorithms have an advantage over asymmetric in that they require less computational power. Asymmetric-Key encryption. Anyone can encrypt data using the public key, but the data only be decrypted with the private key. Image: Dave Gothenburg, via Wikimedia Commons. As for Asymmetric-key cryptography (aka public-key cryptography) we use a slightly different approach. This cryptosystem implements both a private and public key. The public key is used to do the encryption (just like symmetric key cryptography), but the private key is used to do the decryption. The word “asymmetric” stems from the different keys performing opposite functions. This type of cryptosystem is more user friendly, and requires less administration. This is why public-key cryptography is widely implemented across the web. Does the RSA Cryptosystem Really Keep Me Safe? Theoretically, a hacker could factor the modulus “n” in the steps above. Given the ability to recover the prime factors p and q an attacker can compute the “secret exponent” “d” from the public key (n, e). Once the hacker has this “secret exponent”, they can decrypt all data sent with its matching public key. RSA keeps us safe from hackers because there is no known algorithm (The NSA probably has one!) that can factor these large integers in a timely manner. In fact, the largest known number ever factored was 768 bits (232 digits!) long, and this was done with a supercomputer using a state-of-the-art implementation. If that doesn’t make you feel safe enough, RSA keys are typically 1024 to 2048 bits (617 digits!) long, so we don’t need to worry about our data getting hijacked. However it is recommended that we use a value of n that is at least 2048 bits long to ensure the encryption is never cracked. This entry was posted in Big Problems, Practical Math and tagged cryptography, encryption, RSA on November 24, 2014 by k1ngdr3w.